April | 2009 | Ipoh Mali Talak Sombong! *This article has no relation to Chef Michael Smith aka Chef At Home whatsoever. They say looks can be deceiving, and that is so true. That’s what crossed my mind when I met Jared at Patrick’s kitchen in Tamarind, Sentul East one week ago. The 21 years old fella (his birthday just passed last Tuesday, woohoo!) who is working for a famed F&B outlet in Pavilion was busy whipping up a 3-course dinner meal for 8, with deep concentration. “Tonight we’ll have salad as appetizer, one pasta and dessert as ending, all Italian-style, ” he quipped. Watching him “perform” in the kitchen somehow made me ponder, what would happen or where would I be if I were to take culinary arts instead of business information system when I first left school. 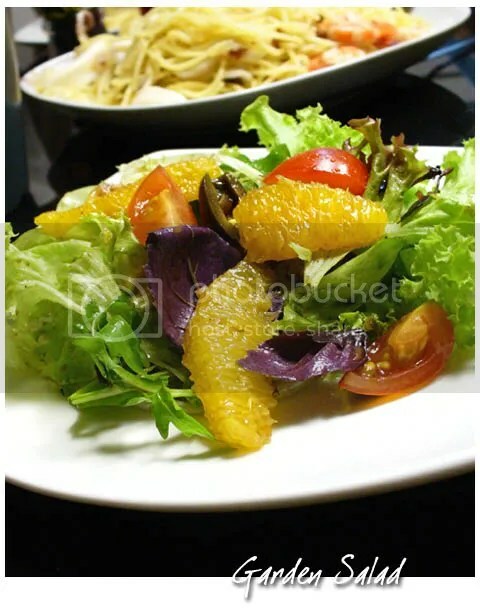 The fresh salad consists of arugula (rocket leaves), mixed coral leaves, cherry tomatoes and oranges, tossed with balsamic vinaigrette (olive oil, balsamic vinegar and finely chopped red onion) has a refreshing and tangy flavour. 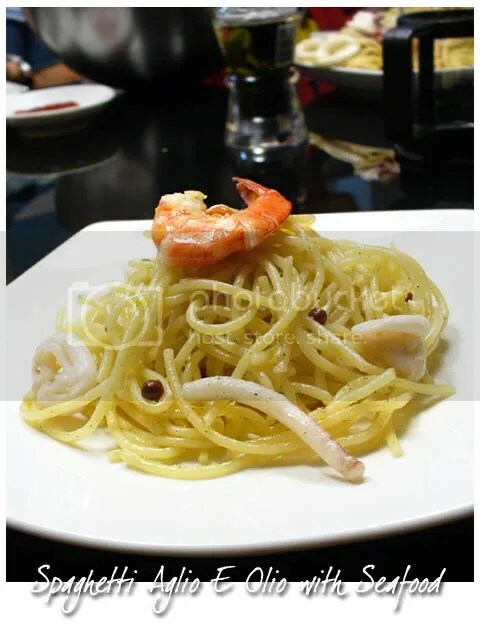 The al dente pasta exudes a lovely garlicky smell while peppercorns lend a spicy edge to it. Most of us would agree that no dinner is complete without dessert. 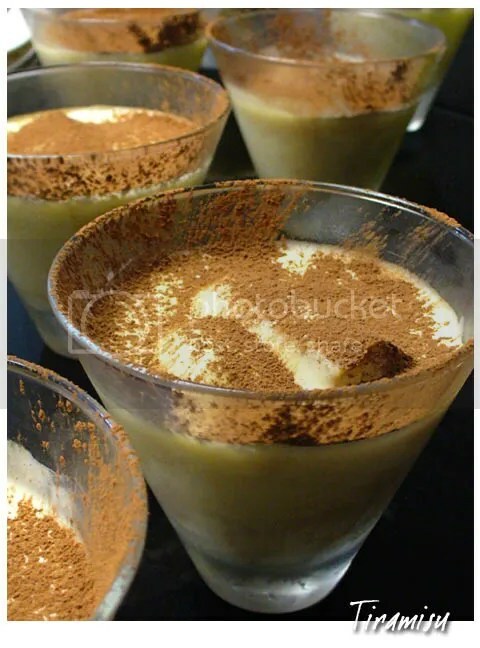 Jared’s tiramisu was oh-so-good with every spoonful loaded with fresh mascarpone cheese, fine coffee liquer and dark chocolate powder. A perfect sweet ending to a simple yet elegant Italian-style home cooked dinner. I’m pretty much looking forward to the next dinner. Else, I could just drop by Godiva at Pavilion to sample his creations. 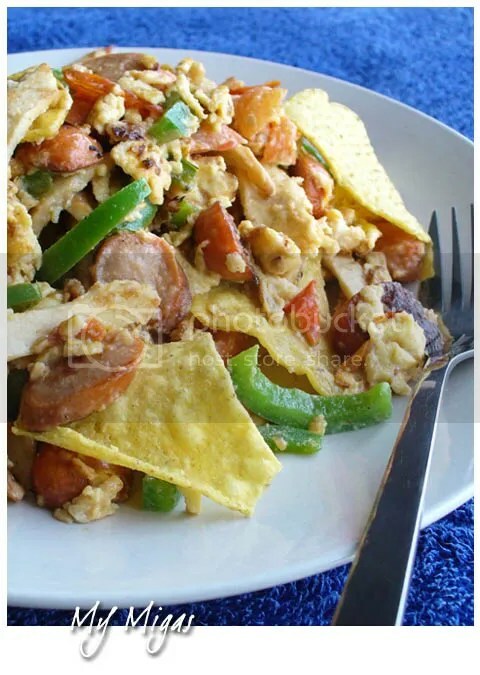 Pronounced as mi-ges (or also known as migajas in Texas) and meaning “crumbs”, migas is a traditional Spanish and Portugal breakfast dish using leftover bread or tortillas, eggs, vegetables and meat. Modern migas in Tex-Mex cuisine uses basically the same ingredients, with additional of cheese, spices and condiments. You can read more about migas here. Rachael called it the Mighty Migas and after I watched how she prepares it, I think it’s quite easy to replicate it in my own kitchen, except a few ingredients that are difficult to find locally. Heat the olive oil in a pan, put in the pork sausage and chicken ham and let it cook till they were slightly browned. Add in garlic and tortillas and cook till the tortillas begins to get crispy (You can also toast the tortillas or deep fry them separately and mix them in later). Put in all the veggies (tomato, capsicum) and mix well till the vegetables begin to tender. Pour in the beaten eggs, chilli sauce and cheese. Stir until the eggs are closed to your preferred doneness and cheese melted. Season with salt, pepper and lime juice. Serve immediately. *I substitute jalapeño pepper (ha-la-pen-yo) with capsicum. Jalapeño pepper is one of the hottest pepper from the US. *I also substitute chorizo with pork sausage and chicken ham as chorizo is kinda pricey here. You can find various type of chorizo at major supermarket’s non-halal section. *I didn’t add any condiments as I found it will be too wet for my liking. You can add sour cream or salsa before serving. You can find Rachael’s recipe from her website here, complete with video clip. When I clean up my hard disk last week, I realized I have loads of pictures I have not posted yet… I shall post them up as soon as possible before I forgets how the food tastes like! 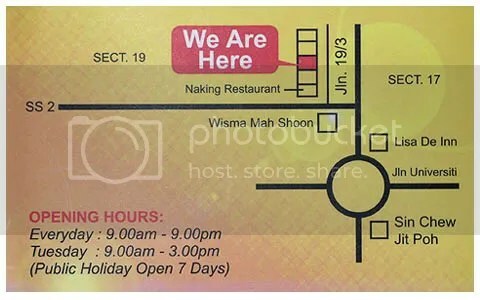 Let start with this restaurant, which I went to two months ago with WMW and Ekeng. But before that, I would like to apologize as I couldn’t attach the price to the food we had as I lost the bill. 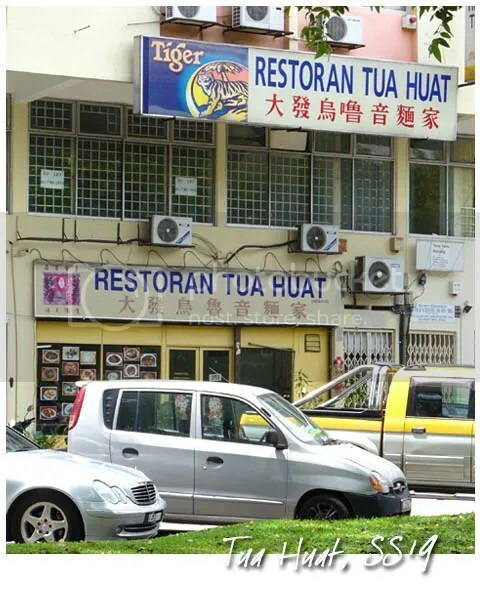 Manned by a team of family members, Tua Huat is located at the same row as Nanking Vegetarian Restaurant at Sec 19, the place is air-conditioned but looks like some sort of a small town eatery that caters for families. 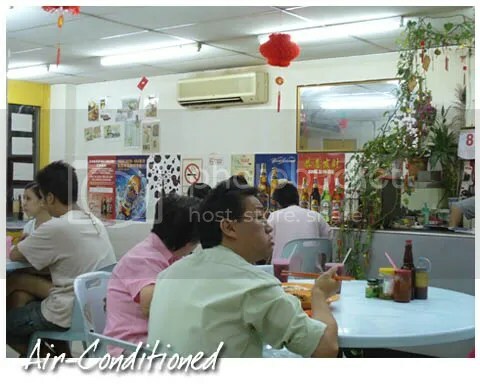 According to WMW, they specialize in Ulu Yam Loh Mee but instead of ordering that, we had something else! 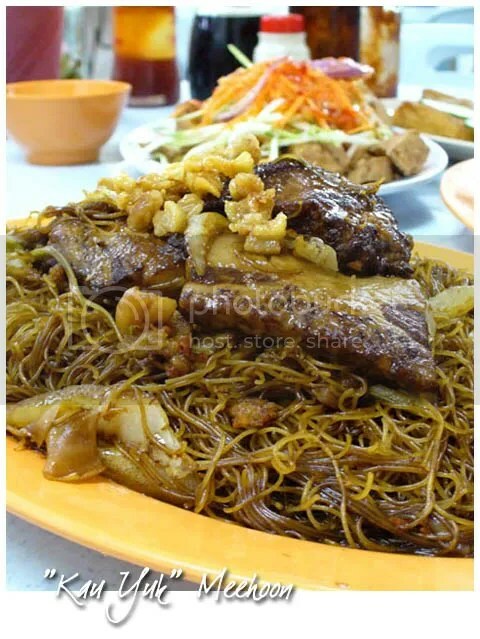 Yeah, we had something more sinful than Loh Mee, the Kau Yuk Meehoon or Stew Pork Meehoon. It was nicely cooked with shredded cabbage, stew pork slices and redolent with wok hei. A handful of crispy lard complete the dish (we actually requested for extra!). 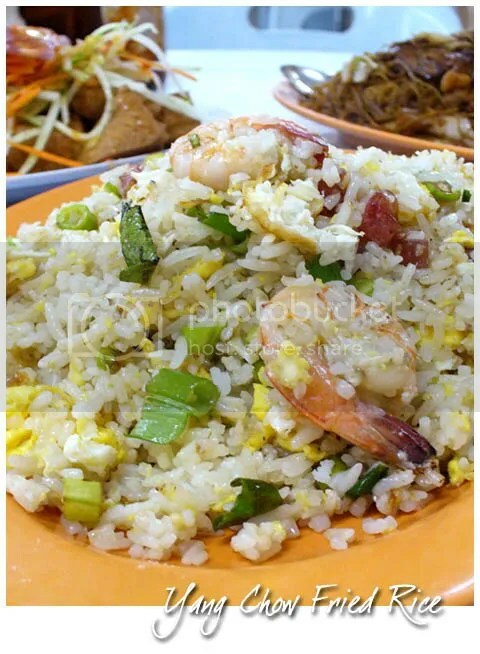 Their fried rice was a bit special here, as they add in curry leaves for the aroma, apart from the usual ingredients. Instead of char siew, they used waxed meat (lap cheong) but I found the rice were a bit wet to my liking. 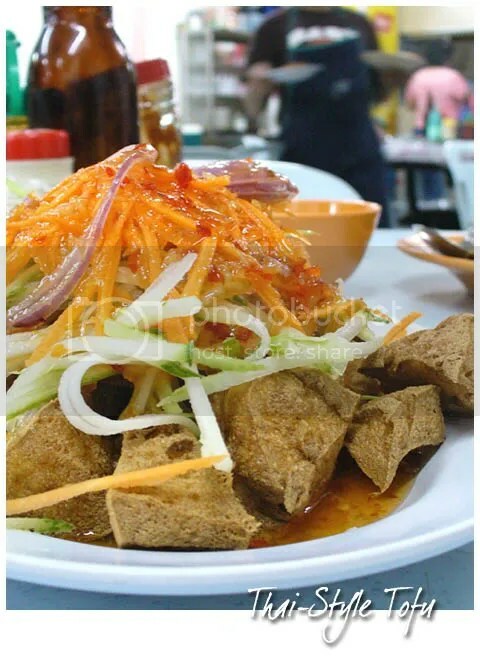 For side dishes, we ordered the Thai-style deep fried tofu, served with Thai chilli sauce, julienned carrot, onion and cucumber. Fried to perfection, the tofu has a crispy exterior but soft inside. 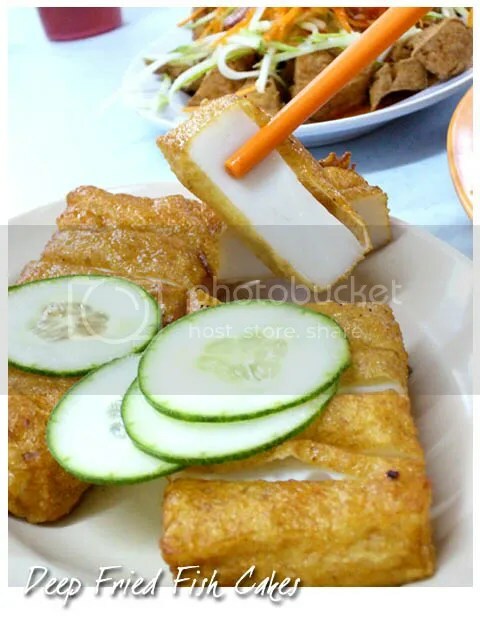 WMW also recommended us to try the fish cakes made of Parang fish. The meat were smooth, firm but springy and not greasy. Overall, it was a good dinner, especially when you had it with good company, the food just tastes much better! Quick, friendly service and food arrives fairly fast to our table.